Whether he is taking photos, filming, painting or making sculptures, Jiang Li is a conceptual artist at heart with no separation between life and art. His works convey a message to challenge our perception of familiar ideas or objects. Objects are often enlarged, put in an unsual form and presented in a new context. As such they daw our attention to a thought or question that hasn’t crossed our minds. I first met Jiang Li when I started working at Ai Weiwei’s studio in 2012 and moved into the room next to him. As the new neighbour, I was promptly invited to tea. Jiang Li’s room was filled with maps, books, skeletons and other interesting objects, all displayed carefully. It felt like I had walked into a wonderful cabinet of curiosities, which seemed to offer a first glimpse into his curious and observant mind. Jiang Li was born in 1985 and grew up in the south of China, at a time when the one-child policy was strictly enforced. After high school, he went on to study design, but moved to Beijing – without finishing his degree and without the knowledge of his parents – to join Ai Weiwei’s studio. Ai Weiwei, who is Jiang Li’s uncle, inevitably has had a formative influence on his artistic development and practice. At the studio, Jiang Li started exploring work with various mediums, and began to develop his artistic language. He started using his phone to meticulously record the world around him. The phone became the archive for his oberservations and social media an indispendable platform. During the past decade, Jiang Li helps to install Ai Weiwei’s show in Australia, Japan, Korea, Germany, Austria, Italy, France, and in the US, amongst other places. He now work and lives between Berlin and Beijing. 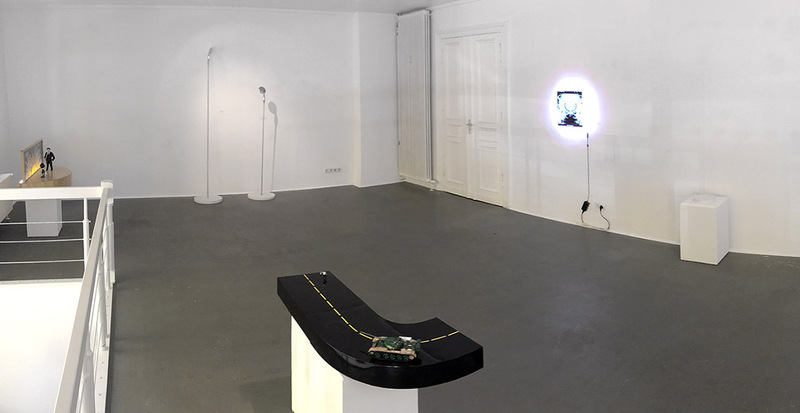 “Showerer: the conceptual artist Jiang Li” is his first exhibition in Germany. 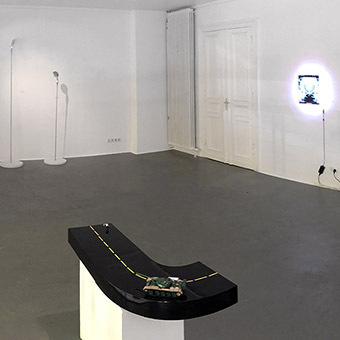 Of the seven works presented, two were created specifically for the show. “Shower head” (2017) and “Apple charger” (2017) are imposing sculptures of everyday objects. The latter one is a blunt critique of our dependence on our phones today, which have become the most essential item we posses. Both sculptures are placed on a small pedestal emphasising their monumental status. Two earlier works in the show comment on the one-child-policy in China. The black and white painting “QLJS:GZZCDRKYJDNHZDMY” (2014) depicts a figure, which is throwing a baby away. The title written in the right corner of the work is the short version of “Quan Li J Si: Ge Zhong Zhang De Chou De Ren Ke YI Jue Ding Ni Hai Zi De Ming Yun (权力就是：各种长的丑的人可以决定你孩子的命运), or “Ugly people can decide your child’s destiny.” If discovered, women were forced to have an abortion despite being half way through their pregnancy. 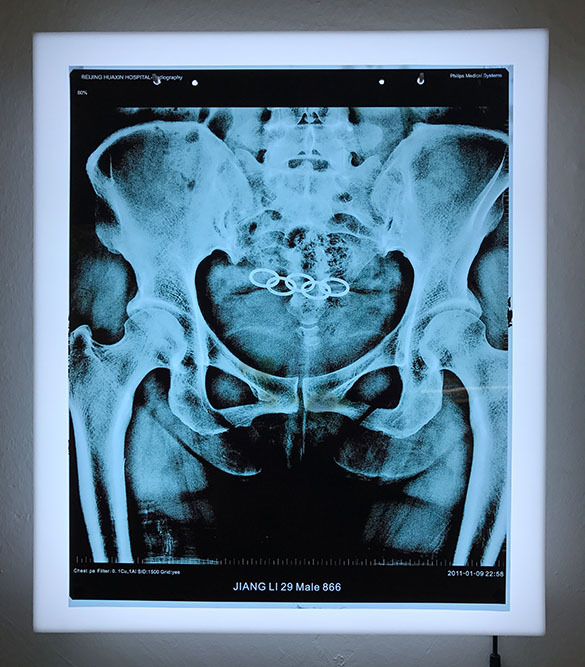 For “5 Rings” (2008), Jiang Li used an x-ray of a female lower part of the body showing a birth control ring, which were compulsory after women have their first child.Jiang Li added four rings to to complete the Olympic sign, as the games took place in Beijing in 2008. “The death of the liar” (2014) is another critical work. It shows a fight between a governmental official and Pinocchio. 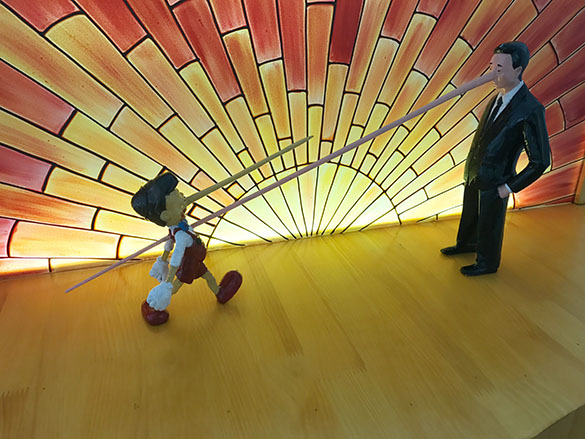 The official’s nose eventually spears through Pinocchio’s body. The exhition will run from the 21st of April until the 30th of May. For any inquiries please contact marlene.carnap@gmail.com. Exhibition on view until 30. May 2017.